Our Wax Worm Bedding/Food is the same good stuff we use to grow our worms. All of our ingredients are natural and chemical free. Some ingredients include pollen, honey, oils, beeswax and more. Ready to go. Use small amounts at a time and add to your wax worm culture slowly as they need it. 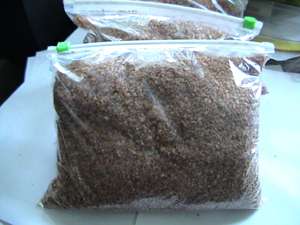 This is also the replacement bedding for our Wax Worm Kit when you run low on bedding/food. 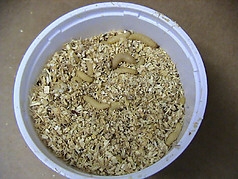 Grow some live wax worms today and learn how to breed wax worms. Shipped Monday through Thursday via USPS Priority Mail from NJ. Check out the video below which shows you how we make our wax worm bedding and the ingredients. Our wax worms get big and fat on this diet.